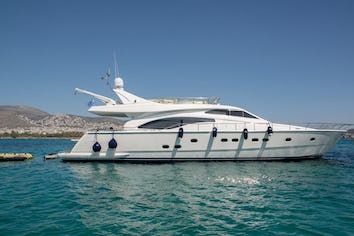 Motor yacht Marino is a true charter hero on the Adriatic! 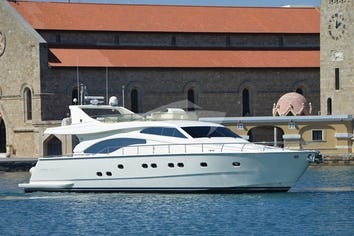 This beautiful Ferretti 730 model with hull in ivory can accommodate up to 8 guests in four well decorated staterooms: Master, VIP and two twin cabins, one of which is convertible to double if so requested by her Clients. Interior is made in American cherry and fine furnishings which give a comfortable and cozy feel. Saloon is equipped with spacious seating area and modern audio and video system. For guests that like to enjoy in their food and view in the same time, there is a very enjoyable dining area on the aft. Those loving the sun can take advantage of the sun loungers placed in the fly bridge as well as on the front of the deck. Fly bridge also boasts seating area with table, mini bar and BBQ. Extensive refit was made in 2014 however every year investments are made to keep her in immaculate condition for each new season. Guests just love her! She comes with crew consisting of Captain, Chef and Stewardess. MARINO can accommodate 8 guests in 4 cabins. Master cabin amidships with a king size bed, two-door wardrobe, vanity with desk, private bathroom (shower and toilet). VIP cabin forward with a queen size bed, wardrobe, private bathroom (shower and toilet). A guest cabin with 2 single beds, wardrobe, toilet en suite with shower. A guest cabin with 2 single beds, wardrobe, toilet en suite with shower. This guest cabin can have a king size bed instead of two singe beds (a pullman) if desired by Clients. MARINO is fully air conditioned through out. Separate crew area (cabins, shower and heads). The Captain, Mateo Bencun was born in 1984. and has professional qualification for Yacht Master up to 500 GT. He started his maritime career in 2009. as a deckhand on few different yachts ranging from 20 to 50 meters. Since 2015. he is working as a Captain and has cruising experience on the Adriatic, Ionian and Mediterranean sea. He was a Captain on busy charter yachts as well and he is very service oriented and ready to take care of his guests’ needs. 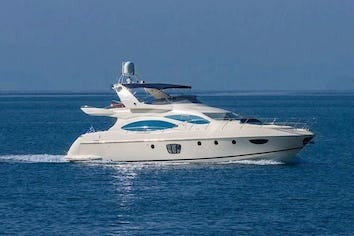 Mateo is confident to provide perfect yachting experiences to his guests together with his crew. Mateo is fluent in English, Italian and has basic knowledge of German. We can't thank you guys enough for making our first trip to Croatia and the Adriatic so incredible. None of us have ever been here before and we had no idea what to expect. To say that this trip and your service has exceeded our expectations is a huge understatement. You guys made every day a blast and our crazy dietary restrictions were met with ingenious solutions and a smile. We love you guys!!! a wonderful trip, pleasant service and excellent food! You created a wonderful atmosphere and a special spirit. As like Kylie sings "Can't get you out of my head", we won't forget this fantastic time with you. Can't get this time out of all our heads!!! thank you to all of you for the most amazing experience we have had during this past week. You have all been exceptional. This holiday will remain in our memory forever. Our love and blessing to you on every journey of life. The past seven days were wonderful! Not just because the weather was excellent, because the service, the food and the kindness of the crew was unbelievable!